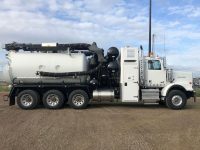 Reasons to Sell Your Truck with Great Lakes Equipment Sales, Inc.
Great Lakes Equipment Sales, Inc. is a licensed, insured, and bonded dealer with over 20-years experience in the environmental, industrial cleaning, and waste hauling business. Our hassle-free service is Completely Free with No-Out-of-Pocket-Fees or Commissions. We will list your truck on our top-ranked truck and equipment websites along worldwide. Our large network of dealers, manufacturers and equipment brokers throughout North America ensure that your truck has the most exposure possible to reach serious buyers. We handle the entire sales process from listing your truck, advertising, taking all sales calls, sending out information, negotiations with buyers, title transfer and paperwork and worldwide delivery allowing you to focus on running your business. Unlike expensive auction companies that charge outrageous commissions and hidden fees, or truck dealers that offer below market value when trying to trade-in your truck, our service allows you to set your asking price and get your truck sold at market value while getting you the maximum return on your investment. Start by filling out our online questionnaire below about your truck, watch our video, and read our guide to photographing your truck. If you have any questions, please email us at info@vacuumtrucks.com or call us at (888) 432-9070. Select One15" Hg.16" Hg.18" Hg.27" Hg.28" Hg. Because We List on Multiple Equipment Websites, Please Indicate If Your Truck is Listed Anywhere Else, If Listed Elsewhere Please Indicate Where? Do You Have Any Truck Photos?